Stephanie Vause slips a shot past traffic at the Smuk Memorial tourney. Even after death, Cody Smuk is still the glue guy. In order to prove that observation, all one had to do was head out to the Sasktel Centre parking lot on Wednesday evening. A large number of Smuk’s friends and family were taking part in the Cody Smuk Memorial Road Hockey Tournament just over a month after the former heart and soul forward with the University of Saskatchewan Huskies Men’s Hockey team passed away. Smuk succumbed in his battle with cancer that lasted over a year. The 16 teams that took part in the event also contained a healthy showing of people that didn’t know Smuk but wanted to take part in a fundraising effort for Choc ‘la Cure, which raises funds for equipment at the Saskatoon Cancer Centre. The night was one that Smuk would have loved to have been part of in person, but was likely there in spirit. People did reminisce about the hard working and gritty skater, and it was obvious everyone came with the focus of having a good time. Two little street courts were set up for 3-on-3 action. The games were pretty much pick-up road hockey games, where the purpose was having fun. You might be hard pressed to find a group of adults anywhere that shared so many laughs. Games included those that hadn’t played hockey a whole lot, to those that currently play in the CIS and WHL and a handful of players from the professional ranks. During the evening, you learned that Dalyce Emmerson, who is a star post player with the U of Saskatchewan Huskies Women’s Basketball team, can knock home goals from in front of the net as easily as she pours in points from the paint. Emmerson was playing on a squad mainly made up of her hoops teammates, who visibly enjoyed a different sporting venture. All the players frequently talked about the plays they made or didn’t make and chuckles always followed as they did. A few teams even came up with specially designed shirts to wear during games, which included the Get Smuk’d squad’s t-shirts that contained the Moose Jaw Warriors logo and the #10 Smuk wore for that WHL franchise. Derek Hulak leads a rush at the Smuk Memorial tourney. For a few hours, everyone was a kid again just playing a game out in the street, and most arrived after toiling in a regular work day. It seemed amazing to think the tourney came together in about two weeks thanks mainly to the hard work of James Vause whose sister, Stephanie, was engaged to Smuk. The games were 16 minutes straight time in length. In the championship contest, team Get Smuk’d, which was made up of some of Smuk’s really good friends and former teammates, came up just short against a squad backstopped by Daniel Wapple, who is the star goalie for the WHL’s Regina Pats. Wapple’s team was believed to have gone by the name Battle Donkey’s. Overall, it was a night everyone will remember for fellowship and comradery. Somewhere, Smuk had to be grinning ear-to-ear seeing his pals have a good time. 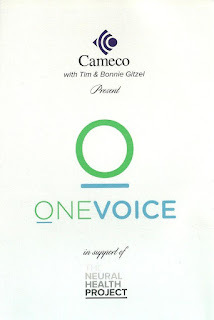 A One Voice fundraiser ticket. A week ago, Saskatoon’s TCU Place hosted a charity event that a unique and warm-feeling vibe. 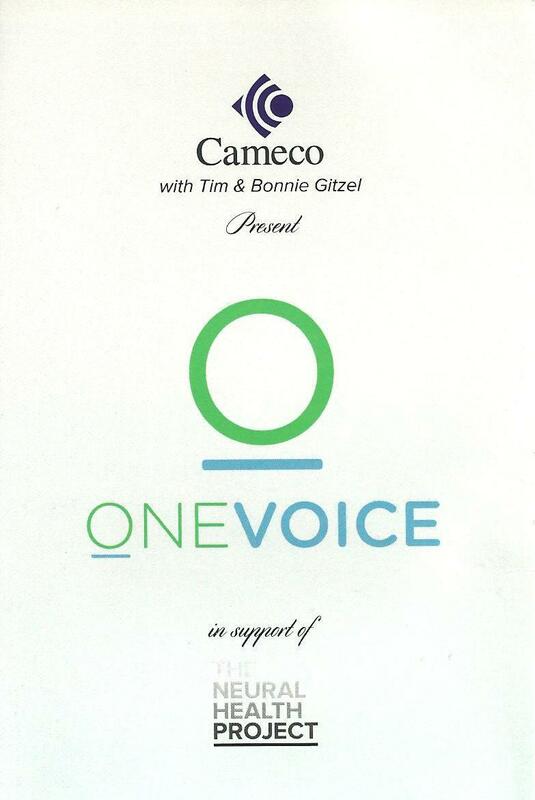 The One Voice fundraiser took place to raise money for the Neural Health Project at the U of Saskatchewan. The hope of the Neural Health Project is to develop a more complete approach to the treatment of mental illness through a combination of conventional and alternative therapies. The event was spearheaded by Mike Babcock, who is the head coach of the NHL’s Toronto Maple Leafs, and Dr. DeeDee Maltman, who is the medical director for the Centre of Integrative Medicine at the U of S. Usually any charity event that involves Babcock is expected to be at least good, and this one way exceeded those good expectations in a spectacular way. The One Voice fundraiser was a $1,000 a plate event, but the large turnout that came to TCU Place were some of the most down to earth people you would meet anywhere. The stars of the night were Michael Landsberg, who hosts TSN’s Off The Record, Clara Hughes, who is a six-time Olympic medalist for Canada, and Kaitlin Hrudey, who is the 22-year-old daughter of former NHL goaltender and current hockey broadcaster Kelly Hrudey. They talked about their battles with mental illness. Landsberg and Hughes both battled depression, and Kaitlin Hrudey has contended with anxiety and obsessive-compulsive disorder. The coolest thing about the night was the fact that mental health and mental illnesses were discussed normally in a big social setting. Unfortunately in today’s world that is still not the case. Often in the workplace, mental health is still the elephant in the room. As someone who has battled with issues regarding anxiety, the One Voice fundraiser was my best night in Saskatoon since I moved to the Bridge City in late July of last year. I admit I shed my share of tears that night, and I also had that warm and fuzzy feeling when Hughes, Kelly and Kaitlin Hrudey and Babcock, who has guided Canada’s Men’s Hockey team to two Olympic gold medal wins, all asked me how I was doing during various visits over the course of the night. It was also amazing to see people rally around Babcock, when he gets behind a cause. For anyone that has battled mental illness, it was inspiring to see someone of Babcock’s stature say what we are doing right now to deal with mental illnesses isn’t working, and we need to find a better way. Over $1-million was raised that night for the Neural Health Project. You almost wish you could bottle up the positive emotions from that event and carry them with you forever. 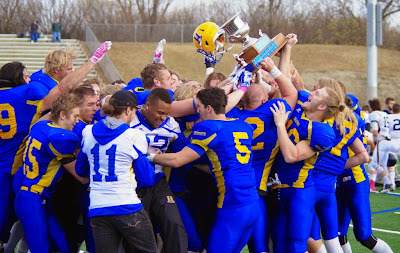 The Hilltops celebrate their PFC title victory at SMF Field in 2014. On Monday, the venerable Saskatoon Hilltops will begin their quest in earnest for an 18th national title. The defending Canadian Junior Football League champions open their main training camp on Monday with practices at 2 p.m. and 7 p.m. at the Hilltops clubhouse. Practices will be held at 7 p.m. on Tuesday and Wednesday at the team’s clubhouse leading to a game against the Hilltops alumni at 7 p.m. Thursday at Saskatoon Minor Football Field. “The Sarge,” head coach Tom Sargeant is expecting to have a veteran laden team going into the 2015 campaign. While the Hilltops have won four of the last five CJFL titles, they will be challenged by an ever improving Prairie Football Conference in 2015, which should lead to a number of compelling games. Saskatoon always seems to consistently rise to the occasion in big moments, and that will likely continue this season to make for some interesting storylines. The Hilltops open the regular season traveling to Calgary to take on the Colts on Aug. 16. Saskatoon’s home opener is slated for Aug. 30 against the Winnipeg Rifles at Saskatoon Minor Football Field with a start time still to be determined. Me trying to be calm about the day ahead. Don’t talk about it. Pretend it doesn’t exist. At times, the silence can be painful. I have no problem admitting I have issues dealing with anxiety, and I have known about these issues since 2012. These are issues and not a full out disorder, but it is something that has affected my life. I have no problem talking about it. I find the more I talk I actually gain allies that want to help. Talking also makes me feel better. During my journey with a mental health issue, I have found that isn’t the case with everyone. I have met people that still hide their mental health problems and issues. I have run into a couple of friends with issues on the mental health front that have warned me to not talk about my issues. They say if you do so you will be blackballed out of life. They said that since I have long gone public with my issues the high point of my life will have been covering the Medicine Hat Tigers WHL hockey team for the Medicine Hat News. Now that I am home in Saskatoon, I can forget about doing anything else of significance with my life. I will no longer be able to get a good job, because I have baggage that will scare employers away. I will never be able to hold a romantic relationship because of the stigma that still surrounds mental health. For all intents and purposes, my life is over. There is a big part of me that doesn’t believe this. During the early years of my career as a sports reporter, I had a habit of proving people wrong. There is still part of me that believes I will persevere. I will find a way. My mental health issue will be part of my life story, but it won’t be the thing that defines me. There was a time not so long ago I never thought mental health would play a part of my life. I can pin the last time I was normal on a day-to-day basis for an extended period as the 2010-11 hockey season, or more accurately, the winter sports season. On a personal level entering that season, I was trying to distance myself from residue that remained from a couple of relationship situations. Due to budget cuts at the News, the winter sports season was very busy. My plan to get on the rebound included not engaging in anything on the relationship front. I was just going to enjoy covering the Hat’s sports scene, and my focus revolved around the Tigers, Medicine Hat College Rattlers and high school football. I had long befriended a number of people in all those walks of life, and I gained a lot of joy covering their journeys through their respective campaigns. In 2010-11, The Tigers had a strong season, and most of the Rattlers teams had successful campaigns. As the calendar turned to March in 2011, the Rattlers seasons closed and the Tigers were gearing up for a playoff run. I was looking forward to the WHL post-season and was feeling really good. Every day was a great day, and even the day-to-day challenges that caused some extra stress didn’t feel like a problem. Little did I know, my life path was going to change drastically over the next few years. This is the part where the story gets tough to tell. I do have to play politics a bit in order to protect good people that meant well but didn’t know how to handle the situations that came up. While covering the Tigers post-season run, I discovered a mental health issue inside my workplace. Before arriving in the Hat in September of 2004, I worked three years at the Prince Albert Daily Herald, and from my training there, I remembered we had the ability to dial a 1-800 number if you discovered something on this front that might be concerning. A number of workplaces have this option in place for their employees, but the News did not. My memory also vaguely recalled an incident in 2001 back in Regina, where a former CTV employee fired a shot through the entrance of his old workplace after being let go. My mind seemed to recall that was linked to mental health, but I wasn’t sure. I had a couple of friends that worked at CTV at that time, and they were freaked. My educated gut feeling was that my discovery at the News should be treated seriously. When playoffs concluded, I told my mom what had happened, and I consulted a small group of three people for advice. Looking back now, I should have expanded the group, but worked to keep some details like names and places vague. That group should have also included my older sister, Michelle Stephen, who has been a social worker for over two-and-a-half decades. I also have to admit my concern at this time was tempered. The summer of 2011 was looking to be an exciting time, as I was pursuing opportunities to make a career move upwards in Calgary and Saskatoon. I was excited, because up to that point in my life, it seemed a break upwards in my career seemed to always work out at the appropriate time. I figured the appropriate time had come again. Unfortunately over a two-week vacation late that summer, it became clear those opportunities wouldn’t work out. I had a good break watching the University of Regina Rams play their season opener and the Saskatchewan Roughriders play in the Labour Day Classic, which included some great social time around those games. 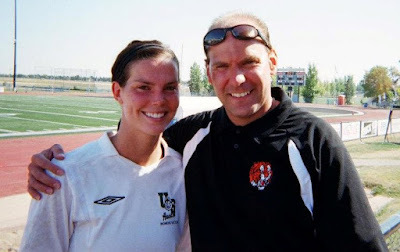 I also kept a promise I made to an old friend from Prince Albert in Elizabeth Hudon, and I watched her play for the University of Saskatchewan Huskies women’s soccer team in her fifth and final season of eligibility. Looking back now, the first bad sign for me came up, when it came time to return to the Hat. I remember getting in my car to leave my mom’s place, and I started crying. That had never happened on a return trip to the Hat. I admitted to her I didn’t want to go back, because I worried about what awaited me. I had kicked the tires about living in Saskatoon in the summer of 2010 for family reasons, but this was totally different. I feared my return to Medicine Hat wouldn’t be good. When I returned to the Hat, I told a member of the senior management at the News about the mental health issue I discovered. I figured that would make everything better. Unfortunately, I think this whole situation was new for the senior manager too, which further complicated things. I was left to manage the issue, and if people say otherwise, I definitely felt like it fell on my shoulders to manage it. To make matters worse, I wasn’t in a position to manage that situation. As the months went on, things kept getting worse, incidents piled up and my mental well-being went down the tube. It seemed like those in the small group that knew about the situation and my mom didn’t think the situation was as serious as I thought it was. This became another lesson I learned on the mental health front. If a mental health situation is discovered and no one acts on it, it becomes way worse. Hanging out with Elizabeth Hudon in 2011 before the tough times. For the longest time, I soldiered on convincing myself everything was in my head. I kept thinking God and life wouldn’t throw anything in my path that I couldn’t handle. With that said, I got to the point where I would shut off my cell phone and disconnect my land line when I was on days off. I basically did what I could do to isolate myself. Things disintegrated to the point in 2012 that I considered suicide, which will likely come as a revelation to my family members let alone my friends. In my mind, I was sick of being the pawn that was shouldered with making everyone else’s life easier. Other thoughts that ran through my mind was that no one outside of my mom would miss me, if I no longer existed. The paper would still come out and each Tigers season would come and go whether I was there or not. I wasn’t in any relationship, so no one would care from that front. I also reasoned that I had a good run at life, as being a sports reporter allowed me to have a number of unique experiences most will never have. I was thinking that it was better to burn out than to fade away. It was around this time my mom arrived for an extended visit, and couldn’t believe the bad shape I was in. Another lesson I would learn is that this journey was extremely hard on my mom. With her arrival, I never did attempt suicide. It was also round this time my social working sister Michelle became more active in the picture. She would drop hints about courses of action to take. I guess she figured I would follow them, when I was ready. One of the actions included going to see my doctor, telling him everything that was going on and getting help that way. I had no clue you could do such a thing. After a couple of incidents at the start of the 2012-13 season, I decided I would see a doctor, but not just any doctor. I was going to go see the team doctor of the Medicine Hat Tigers, Bill Ruzycki. My mind was made up that he would be able to make me better. The thinking came from the fact the Tigers former long-time head coach and general manager Willie Desjardins, who is currently the head coach of the NHL’s Vancouver Canucks, had his master’s degree in social work, and I felt very confident mechanisms were put in place with the Tigers medical staff to deal with mental health issues. With that in mind, I didn’t want to see anyone else other than Dr. Ruzycki. To be honest, I did not have the greatest faith in the staff at the News at that point in time to be able to handle things. I was put on medical leave for November of 2012. Dr. Ruzycki set me up with a really good councellor and a plan was put in motion to help me get better. I wanted to get better without the use of drugs. I found out I developed issues dealing with anxiety due to my situation at work. I started to learn about how breathing exercises and meditation could help. I also tried to do my best to learn more about mental health. That is still an ongoing process. My best listeners during my medical leave included former Tigers Brennan Bosch, Ryan Holfeld and David Schlemko, as well as Kelsey Konihowski and Talayna Tremblay. Konihowski and Trembley were still members of the Rattlers women’s volleyball team at the time, and I felt secure talking to them due to the fact they had been in nursing at one point in time. Schlemko, an NHL veteran defenceman who finished last season with the Calgary Flames, came back to town when I was on leave for a funeral, and he has always been genuine and trustworthy. 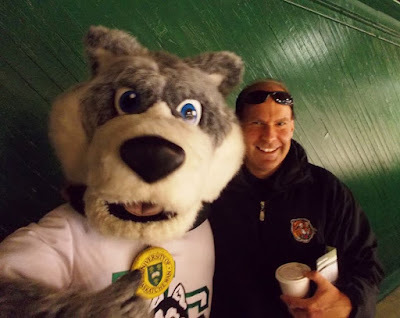 I also went to see Bosch and Holfeld play with the Huskies men’s hockey team, and going to those games became a regular tradition for me to get into a different but good world for a short time. When I was gone, the News brought in the human resources department to handle the issues that were in place. I returned and had a good 19 months. There were still a lot of changing stresses due to budget cuts at work, which no one could really control. A pile of 30 reasons built up, where I thought it would be best to switch scenery. At the end of June of 2014, I resigned from the News to move to Saskatoon to be close to family. I was giving a heartfelt and unreal great going away. No matter what happened in that building, I still see everyone there as being good. I believe everything that went down was a learning experience for everyone as it was for me. It wasn’t one anyone always liked, but it was a learning experience none the less. I will go out for pops with anyone from that place at any time. Now in Saskatoon, I have to be honest and admit some residual effects from what I encountered in my last three years in the Hat still surface. From time to time, my anxiety will get heightened due to triggers I would never suspect. On the bright side, I have become more mindful in recognizing what is happening, which has helped to get me settled down. It has also been great for me to reconnect with Cam Hutchinson, who is the editor of the Saskatoon Express and former long-time managing editor of the Saskatoon StarPhoenix. He has gone public with his battles with anxiety, and when I talk to him, it feels like someone else actually does know what I am going through. I tell my mental health story in hopes people can learn just how quickly things can go downhill, even if you were at an awesome and healthy place at one point in time. On Friday night, I will be heading to the One Voice fundraiser at TCU Place here in Saskatoon, which supports the Neural Health Project at the U of Saskatchewan. From what I understand, the hopes of this project are to develop a more complete approach to the treatment of mental illness. Mike Babcock, who is the head coach of the NHL’s Toronto Maple Leafs, and Dr. DeeDee Maltman are the ones behind the idea of the One Voice fundraiser. The idea for the project and fundraiser came about after the deaths of Saskatoon products Ian Buckwold and Jordan Chartier in July of 2013 at the hand of mental illness. Their deaths were hard on their family and friends. Out watching a Huskies hockey game with Howler. I plan to learn more about the Neural Health Project, and I am hoping it will create an avenue to better treat mental illness. The fact Babcock is involved in this fundraiser increases my optimism for the project. I will see a lot of people I have met from the sports world again on Friday night, and I expect to make some new friends. A lot of the people attending the One Voice fundraiser have had their own mental health battles. I expect I will learn some new lessons about mental health on Friday night, but I plan to go for all intents and purposes to have a good time. I hope I can add to the conversation and gain another reminder I am not alone in my mental health journey. Three officials get together to discuss a penalty call. The CFL officials deserve a thumbs up. The men in the black and white striped shirts have been totally consistent calling the league’s new standard in flagging pass interference and illegal contact on a receiver penalties. Do to that consistency, everyone that watches the CFL has a pretty accurate painting of what the game looks with the strict enforcement of these fouls with four weeks of the season in the books. Now, everyone has to decide whether they like how the game looks now or not. It seems routine now for both teams to record over 100 yards in penalties in each contest and for quarterbacks to complete 80 per cent of their passes. You also have to wonder if games now are weighted too much against the defence. A signature play to show how much the defence is hampered came from the B.C. Lions 27-24 victory over the Saskatchewan Roughriders on Friday at Mosaic Stadium. Near the end of the third quarter with the Lions on the Roughriders 29 holding a 20-11 lead, B.C. quarterback Travis Lulay threw a deep pass into the end zone to receiver Shawn Gore, who ran a wheel route on Riders defensive back Michael Carter. Carter was flagged for pass interference, which brought the ball to the Saskatchewan two. Saskatchewan head coach Corey Chamblin threw the challenge flag in hopes of reversing the penalty call. The call stood up after a review. Two plays later, the Lions opened the fourth quarter scoring a touchdown as Lulay connected with receiver A.C. Leonard to make the score 27-11. The Lions ultimately had strategic control of the game that stood up despite a late Roughriders rally. In dissecting the pass interference all that helped set up B.C.’s final major, it was clear that minor contact occurred between Gore and Carter halfway through the route. The two ended up hand fighting for a second before Lulay’s pass sailed way over the pair. Gore made a fruitless dive for the ball, but he had no chance of coming up with the pass. In Carter’s defence, you can argue there shouldn’t have been a penalty because both he and Gore participated in the hand fighting and the ball was not catchable. However, the officials have set the standard this season that any downfield contact on a receiver will be flagged, and the penalty call on Carter was consistent with what has already been called in the 2015 campaign. The referees and linesman grade out high for not swaying from that standard. The officials should continue to do what they are doing right through the end of the post-season. When the off-season rolls around, all those involved with league meetings have to decide if they want this standard of enforcement to be maintained. To make a change mid-season would be the biggest thing any league could do to damage its credibility. An official stands beside Riders receiver Rob Bagg. Besides discussing the pass interference calls, the league has to examine how it is calling all infractions. At the start of the 2014 season, it was deemed the league need to call penalties more tightly. That resulted in numerous defensive battles, because the excessive penalty calls helped bring offences to a standstill. The highlight or lowlight of the season came in the 102nd Grey Cup in Vancouver on Nov. 30 between the Calgary Stampeders and the Hamilton Tiger-Cats. With the Stampeders holding a 20-16 edge inside of the final minute of the fourth quarter, they had to punt the ball away to dangerous Tiger-Cats returner Brandon Banks. On an electrifying return, Banks ran the ball back 90 yards for the apparent winning score with 35 seconds to play. Hamilton linebacker Taylor Reed was flagged for an illegal block on Calgary linebacker Karl McCartney that erased the TD, and the Stamps held on for a 20-16 victory. If Bank’s major stood, the 102nd Grey Cup would be vaulted into classic status. In the end, it was still a good game, but it could have enjoyed a loftier position in CFL history. In order to get offences rolling, the league’s brain trust in the off-season decided to get tougher on the interpretation of defensive pass interference and illegal contact on a receiver. In another weird twist, offensive yardage is up all over the place, but the 38-34 style offensive shootout common in the late 1980s and early 1990s hasn’t returned. It is safe to say it was hoped the rule changes would greatly increase scoring, but it hasn’t. There has only been two games where both teams have score more than 30 points. During that last clash between the Riders and Lions, Saskatchewan was flagged 14 times for 159 yards, while B.C. had 11 infractions for 93 yards. Those types of penalty numbers have been the norm. When you viewed Saturday’s battle between the Stampeders and Winnipeg Blue Bombers in Calgary, it can be argued teams can adjust to how penalties are being called. The Stamps slipped past the Bombers 26-25 in an outstanding game. Calgary was flagged 12 times for 92 yards, while Winnipeg had nine infractions for 61 yards. Officials sort out a play in a game featuring the Roughriders and Argonauts. The Stamps penalty yardage spiked a bit due to procedure calls, because they had to work in a number of backups to replace injured starters. With all that said, it would be great to see officials to have the ability to make a no call, if it is deserved. If a pass is not catchable and both the receiver and defensive back are hand fighting for example, don’t throw a flag. If the casual fan decides to stay away due to how the game looks, that will likely force the CFL’s brain trust to make more chances in the off-season, which hopefully means calling penalties the way they did in 2013. Scott Steckly and crew celebrate winning the Prairie Thunder 250. Scott Steckly was worried the hand of fate might deliver a cruel blow. The Milverton, Ont., product consistently worked his way to the front of the field at the Bayer CropScience Velocity Prairie Thunder 250 at the Auto Clearing Motor Speedway here in Saskatoon, but victory was far from a sure thing. The NASCAR Canadian Tire Series race was plagued by a number of cautions over the last 60 laps, and Steckly was worried about losing jump after the various restarts. The longest stop saw the field forced to drive about 25 laps under a yellow flag due to a light spitting rain that fell on the track. Those laps were split up with a lengthy wait after the race was red flagged. The racers went to the pits, while the tow trucks and emergency vehicles on site ran laps to help dry out the track. After the race returned to green from that ordeal, about three more cautions followed due to various accidents. Those obstacles didn’t stop Steckly from pulling out his second career win in Saskatoon, as he crossed the finish line edging out Jason Hathaway. Andrew Ranger (#27) holds an early race lead over Scott Steckly. For most of the first 190 laps of the race, Steckly was trying to hold off Andrew Ranger, who ultimately finished third. The top spot did rotate between the two Dodge drivers, as Ranger jumped to the front on a handful of occasions only to be overtaken by Steckly. Louis-Philippe Dumoulin, who claimed Prairie Thunder 250 and the NASCAR Canadian Tire Series title last year, made a challenge for top spot late in the race moving up to second place. His push for victory was halted, when he had to pit during a caution to fix a problem with his front right tire. Jason Hathaway (#3) made a challenge for first before finishing second. Hathaway came on strong during the second half of the race. The St. Thomas, Ont., product held the lead for a short time, when he jumped to a quicker restart than Steckly did after one of the late caution periods. “I got a real good restart on the outside, and on the second one, I didn’t,” said Hathaway. “I spun the tires a little bit. Hathaway said a scheduled five-minute break at the race’s halfway point allowed his pit crew to make adjustments to his Chevrolet, which allowed him to be more of a factor in the race. The break allowed all the drivers a chance to change up their tires and take on added fuel. “It was a pretty cool,” said Hathaway. “We got to lead some laps. Scott Steckly crosses the finish line to win the Prairie Thunder 250. Steckly said he was pushed the whole race by the 19 car field that hit the track, which made the win feel that much better. The Prairie Thunder 250 finished out a busy stretch for the NASCAR Canadian Tire Series, which saw the circuit hold three races over 11 days. With two straight wins, Steckly leads the series standings with 247 points, while Hathaway is second with 243 points. Ranger and Gary Klutt are tied for third spot with 222 points. The NASCAR Canadian Tire Series resumes action on July 25, when the Lucas Oil National 250 is held at the Autodrome St-Eustache in St-Eustashe, Quebec. If you have any comment to make about this blog post, feel free to email them to stankssports@gmail.com. Check out more race photos on Twitter @StanksSports. Kevin Dyck repeated as Family Pizza 100 pro truck race champion. Kevin Dyck loves long races, because he constantly seem to find victory in them. The 21-year-old pro truck class driver has learned that patience is a virtue when you running in a 100-lap race. On Tuesday at the Auto Clearing Motor Speedway, Dyck calmly worked his way to the front of the field to take the lead in the Family Pizza 100 pro truck feature race shortly after the race’s halfway point. He proceeded to put the pedal to the medal to claim the class’s annual marathon race for a second straight year. “It feels pretty great,” said Dyck. “It is a long race. It hits you physically. Dyck’s race win was part of two-day program at the Saskatoon based oval track that is part of the NASCAR Canadian Tire Series’s Bayer CropScience Velocity Prairie Thunder 250. Tuesday’s action contained three big feature races for some of the track’s local classes including the Family Pizza 100, the Bryce Mann Memorial 75 super late model race and the Wes Skakun Memorial 50 street stock race. The Velocity Prairie Thunder 250 is slated for Wednesday at 6 p.m. In the Family Pizza 100, Prince Albert product Shantel Firth held the lead for much of the early going in her 2013 Dodge Ram. On the race’s 38 lap, Andrew Hardy snuck underneath Firth to assume top spot in his 2015 Dodge Ram. Hardy’s time in front lasted for about 15 laps before Dyck assumed control of the race in his Chevy. At the finish, Dyck held a comfortable lead over second place finisher Ben Pogoda, while Hardy came in third. Brennen Forseille holds off the street stock field. Dyck said the fact his tires stayed good throughout the race was a big key in his win, and he focused on saving his big charge for the later stages. “I was going pretty easy,” said Dyck. “I wasn’t really pushing the truck real hard. I was just rolling it in. Brennen Forseille took the Wes Skakun Memorial 50 in his 1979 Chevrolet Camaro thanks to his ability to stay clear of trouble. Thanks to some mishaps on the track, only four of the eight cars in the field crossed the finish line. Scott Barrand, who was taking part in his first race of the season, took second place, while Curtis Houben placed third. The 25-year-old admitted the win was bittersweet due to the accidents that took place. In the Bryce Mann Memorial 75, veteran Jim Gaunt showed why he is one of the all-time greats to race in the Saskatoon Stock Car Racing Association. The 60-year-old smoothly worked his way to the front of the 11-car field by the race’s 23rd lap. Jim Gaunt makes another victory lap at the Auto Clearing Motor Speedway. Gaunt, who has won 13 class championships, zipped around the track in his 2015 Impala SS with textbook efficiency, which included make a pass around a group of three lapped cars look easy. Howie Crossman finished second, while Dave Bone came in third. Wednesday’s NASCAR Canadian Tire Series Bayer CropScience Velocity Prairie Thunder 250 contains a field of about 34 cars including standout drivers Jason Hathaway, Scott Steckly and Alex Tagliani. Edmonton product Erica Thiering is also trying to turn heads during her first full season the NASCAR Canadian Tire Series circuit. Louis-Philippe Dumoulin claimed last year’s series NASCAR Canadian Tire Series title and won the stop in Saskatoon. The Bayer CropScience Velocity Prairie Thunder 250 closes a stretch where the Canadian Tire Series hosts three races in 11 days. The Roughriders defence has given up over 1,300 yards in three games. The Saskatchewan Roughriders love to torture their fans. In Canada, the only sports teams that arguably have more rabid fans than Rider Nation are the NHL’s Montreal Canadiens and Toronto Maple Leafs. While supporters of the green and white look forward to relishing in all the fun that comes along with cheering for the team, they also know it won’t be a joyride. The Riders are also well known for winning games in a fashion that isn’t easy, and they are notorious for snatching defeat from the jaws of victory. The start of the 2015 CFL season has been one of those stretches that has Roughriders fans shaking their collective heads in disbelief. The team has dropped three straight games to open the campaign, and all three outings could have been won as easily as they have been lost. Friday night at B.C. Place in Vancouver proved to be one of the breaking points of frustration. The Riders assumed a 29-18 lead over the host B.C. Lions with 2:21 to play in the fourth quarter only to see the Lions rally back for a 35-32 overtime victory. Almost immediately after the game, social media, especially Twitter, exploded with Rider fans expressing their disgust over the outcome. Rider Nation was in a very cranky mood. The game’s turning point came when the Riders were trying to run out the clock after B.C. closed to within 29-26 on a 46-yard TD reception from former NFLer Austin Collie, who followed that with a catch for a two-point convert. Saskatchewan faced a third and one from its own 48 with exactly a minute to play. The Lions were out of timeouts, and a first down would all but assure a Rider victory. The visitors would be able to run out the clock by kneeling down on the ball. Unfortunately for the green and white, backup quarterback Brett Smith was stuffed on a sneak play by Lions linebacker Adam Bighill. QB Brett Smith runs the Riders short yardage offence. The decision to gamble by the Riders was the correct one, because that was a key point where you had to make a play to win the game. The fact the Riders didn’t make the gamble opened the door for a boatload of criticism of the coaching staff for many other aspects of the setback. The Saskatchewan bench bosses almost received a reprieve, when Lions rookie kicker Richie Leone had to attempt a 56-yard field goal to force overtime. The Roswell, Georgia, product just slipped the lengthy pressure kick over top the crossbar to force a 29-29 tie with 15 seconds to play. The Riders scrimmaged from their own 35, but didn’t even try to move the ball into range for a winning field goal. They took a couple of knees to go to overtime. The visitors had the first possession in the shootout OT format and faced a third and one from the B.C. 26. Saskatchewan rejected the option to gamble and went for a 33-yard Paul McCallum field goal to go up 32-29. It took the Lions just three plays to move 35 yards on their OT possession, which culminated in a winning four-yard TD catch by receiver Emmanuel Arceneaux. On social media, a number of people in Rider Nation heaped criticism on the team electing not to gamble on third and one, when the Riders had their offensive possession in OT. At that point in time, electing to go for the field goal was the correct decision in order to have a score on the board. The fact the Riders didn’t try to move the ball in the final 15 seconds of the fourth quarter after the Lions tied things up was another story. Saskatchewan has assumed just criticism for its porous defence in the early going. The Rider offence has been going at full speed, but the defence has been soft, especially defending the two-minute drill situation. The Lions seemed to pick up yards at will on their final TD drive in regulation and the winning TD drive in overtime. In the Riders previous outing on July 5, they fell 42-40 in double overtime at home on the turf at Mosaic Stadium after the Toronto Argonauts completed a two-minute drill march at the end of the fourth quarter. That march resulted in a 16-yard TD catch by Chad Owens to force a 28-28 tie. Disappointed Rider fans leave Mosaic Stadium on July 5. Saskatchewan opened the season on June 27 at Mosaic falling 30-26 to the Winnipeg Blue Bombers giving up 470 yards in offence. The Riders proceeded to give up 367 yard in offence in the setback to the Argos and 480 yards of offence in the cough up to the Lions. In the off-season, the Riders let the personable Ritchie Hall, who has won one Grey Cup ring with the team as a player and two as defensive coordinator, leave for the Bombers, who are now 2-1. Head coach Corey Chamblin felt bringing Greg Quick as the new defensive coordinator was a shake up his club needed. Three weeks into the season, Quick is on the hot seat, Chamblin is getting thrashed for the decision to change DCs, and Rider fans are wishing Hall never left. The heat will keep coming until the Riders hit the win column. It will definitely be a long practice week at Mosaic leading up to the Roughriders next encounter, when they host the Lions (1-1) at 8 p.m. on Friday. When you see the recent media buzz involving former Saskatchewan football star Brent Dancey out in Alberta, you can definitely see the political world can be a mean and tough one. For those that have long memories in the wheat province, they can recall that Dancey was a stellar defensive end for the Regina Rams, when they were still in the Canadian Junior Football League, from 1995 to 1997 and the University of Saskatchewan Huskies from 1998 to 2002. The quarterback sack specialist helped the Rams win the Canadian Bowl for CJFL supremacy in 1995 and 1997. 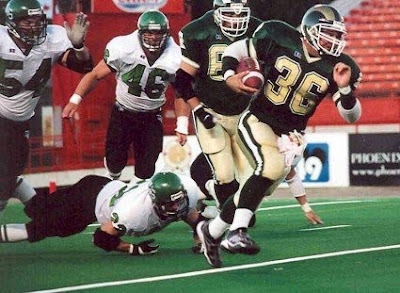 Following the run with the Rams, he was a key figure in helping the Huskies win the 1998 Vanier Cup and the Hardy Cup in 2002 for a Canada West title victory. 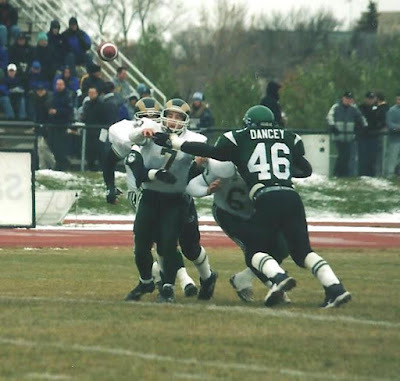 The 2002 post-season run saw the Huskies fall in the Vanier Cup to the Saint Mary’s University Huskies. In Alberta, right-wing columnist Ezra Levant is trying to blind side Dancey with a Ray Lewis massive style hit in the political arena. Most that knew Dancey from his time with the Rams and Huskies wouldn’t have been aware that he became the chief of staff to Shannon Phillips, who is the minister of environment and parks and is also responsible for the status of women in Alberta’s NDP government, just before the middle June. Levant revealed in late June on his website that Dancey was sentenced to nine months in jail after he was convicted of assault causing bodily harm in 1994. On that same web post, Levant started a petition asking Rachel Notley, who is the Premier of Alberta, to fire Dancey. The CBC later reported that Dancey was pardoned for the crime in May of 2005, and the documents from the courts in Saskatchewan were released to Levant by mistake, because they were sealed. Dancey was 18 when he was involved in an assault at a party in 1993 in Regina. I knew Dancey when he was with the Rams and the Huskies. I last saw him in 2002, so at first, I wasn’t sure if the person Levant went after was the same person that was a standout on the gridiron. I received that confirmation from a couple of media sources including talk show host John Gormley. Brent Dancey (#46) puts pressure on Rams QB Mark Anderson. I think it is safe to say that most of the people that played for and were involved with the Rams and Huskies during those years were unaware of Dancey’s conviction. There might have been one or two individuals from each program that might have known. The Dancey I remembered was far from a hardened and violent criminal Levant tried to portray. When I first met Dancey in 1997, I remember he had a reputation for being a wild man with regards to partying and riding motorcycles, but he had calmed down a lot during his time with the Rams. The party stories were all fun and happy type stories. He was an aggressive competitor and a wild man on the field. He took a few unnecessary roughness penalties, but he always apologized to the coaches for those mistakes. Off the field, he was really respectful, analytical and intelligent. I remember young women used to like hanging out with Dancey in social settings, because they viewed him as having a brain and not as a dumb jock. With the Huskies, Dancey, who stood 5-foot-11 and weighed about 210 pounds back then, was a model citizen, one of the team’s captains in 2002 and he graduated with his honours in English and history in 2003. Anyone who knew Dancey in his post-secondary football days has a whole host of good memories of him. If his conviction became widely known with either the Rams or the Huskies, I believe it wouldn’t have been a big deal. The best aspect of elite sports teams is they are forgiving, and the Rams and Huskies were full of players back then that were characters with character. Brent Dancey (#46) is left in the dust of Rams RB Neal Hughes. The reaction would have been so what, you are productive and you are fine now. Let’s move on, because that is in the past. Unfortunately in the political world, your old sins are always brought to the forefront to work against you. Levant did his best to dump on Dancey and said Dancey shouldn’t have anything to do in connection with the status of women. Levant also had a problem with the fact Dancey was not a natural Albertan and was brought in after formerly working as a special advisor to cabinet on energy issues for Manitoba’s NDP government. What Levant is doing in all reality borders on being a witch hunt. If Dancey had a whole string of convictions since that 1994 conviction, then there might be reason for the public to be concerned. His record has been clean since that conviction, and he has long past the point of being allowed to go on with his life. I remember sitting in the newsroom of the Medicine Hat News and hearing police do checks on people who had a long list of violent convictions and upcoming court dates, and those people were still on the streets. I would be more worried about those people as opposed to a person that committed one crime and was pardoned for it. 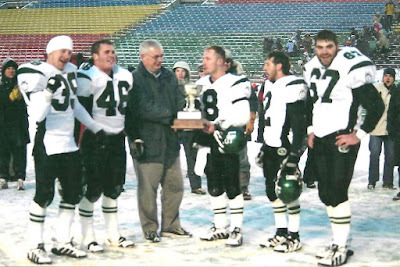 Brent Dancey (#46) and the Huskies get the Hardy Cup in 2002. I also realize there are people out there that believe any person that is convicted of just one crime no matter what it is should be placed under punishment permanently or should almost be given a death penalty. If someone in a case like Dancey’s isn’t given the chance to get back into society and do good, it opens the door to do more harm. As it is, Dancey’s conviction is over two decades old, and it should have been left in the past. He has more than earned the right to no longer be haunted by this ghost. During my career in the media, I can’t even count the number of interviews I have forgotten about, but two I recently did for the Saskatoon Express definitely rank at the top. The Canada Remembers Our Heroes Airshow, which runs all day Saturday and Sunday at the Auto Clearing Motor Speedway in Saskatoon, plays host to the 9/11 Never Forget mobile exhibit. The exhibit, which will be seen for the first time outside of the United States, is a 53-foot tractor-trailer, which unfolds into a 1,000 square foot memorial about the infamous terrorist attacks in New York that includes artifacts, documentary videos and recordings of first responder radio transmissions. Accompanying the exhibit to Saskatoon is retired New York City firefighter Herbert Penner, and his son and current New York City Fire Department member, Michael. The two will give tours of the exhibit. I interviewed the Penners about their experience that fateful day. Herbert worked the day of the tragedy, while Michael was a freshman student in college and saw his morning English class for that day get cancelled. It was unreal to hear both give their first-hand accounts from that day. You can check out that story right here. The upcoming hump day will be a great day for the Auto Clearing Motor Speedway. This coming Wednesday the local track hosts its most anticipated event of the year as the NASCAR Canadian Tire Series stops in with the Bayer CropScience – Velocity Prairie Thunder 250. The Canadian Tire Series is a minor league circuit that prepares drivers to compete one day on NASCAR’s top level – the Sprint Cup circuit. The field for Wednesday’s race, which starts at 6 p.m., will included about 34 cars including a Ford driven by Edmonton product Erica Thiering, who is one of two regulars from Western Canada on the circuit. I caught up with Thiering for the Saskatoon Express that story can be found right here. The NASCAR stop is a two-day event. This coming Tuesday at 7 p.m., three local classes hit the track for the Street Stock Wes Skakun Memorial 50, the Super Late Model Bryce Mann Memorial 75 and the Family Pizza Pro Truck 100. Darian Durant is attended to by the Roughriders training staff on June 27. If you live in Saskatchewan, you know you can talk about the CFL’s Roughriders at any time, all the time and get heated dissecting every facet of the team. Since taking the field and falling in their regular season opener 30-26 to the Winnipeg Blue Bombers on June 27 at Mosaic Stadium, there is no shortage of things to discuss surrounding the green and white in Rider Nation. Everything is not all good, but everything is not all bad. • The worst news revolves around starting quarterback Darian Durant, who ruptured his left Achilles tendon shortly before halftime in the season opener. Durant completed 13 of 18 passes for 165 yards, two touchdown passes and no interceptions before being carted off the field. Durant tore a tendon in his right elbow last season in a 30-24 win over the Blue Bombers on Sept. 7, 2014 in Winnipeg. That injury occurred when the officials didn’t blow a play dead at the snap with certainty in a loud Investors Group Field, which saw half the players stop and half continue on the play. Bombers defensive end Bryant Turner continued with the play and nailed Durant to cause the injury. The elbow injury was created by an unfortunate set of circumstances. The ruptured Achilles occurred due to bad luck. Durant dropped to the turf after following through on a pass, and he wasn’t even contacted on the play. The 32-year-old has already cemented his place as a Roughriders legend leading the team to a Grey Cup championship at home in 2013 and Grey Cup appearances as a starter in 2009 and 2010. He was also part of the Roughriders 2007 Grey Cup championship team as a third stringer. For anyone that has dealt with Durant for a number of years, you know he legitimately cares and enjoys being the starting quarterback of the Roughriders, and he has excelled in that role. That hasn’t always been the case for a club that endures arguably more scrutiny from its fan base than any other sports team outside of the NHL’s Toronto Maple Leafs and Montreal Canadiens. Here is hoping Durant’s luck changes on the injury front in 2016. • The Roughriders need to play tougher and more aggressive defence going forward in 2015, if they want to have any shot of challenging for the Grey Cup. Against the Bombers, the Roughriders defence gave up 28 first towns, 325 yards passing, 145 yards rushing and failed to force a turnover. Winnipeg running back Paris Cotton had 108 yards on the ground on just 13 carries. The Roughriders defence missed numerous tackles and was non-existent. The fact the Bombers were able to drive the ball at will was also disheartening. Safety Tyron Brackenridge is expected to return to the Roughriders defence for Sunday’s game against the 1-0 Toronto Argonauts (1:30 p.m., Mosaic Stadium), so that should help Saskatchewan’s defensive unit. Kevin Glenn (#5) calls out signals for the Roughriders. Kevin Glenn, the offence looked good. The Roughriders put up 285 yards through the air and 212 yards on the ground without injured star receiver Weston Dressler, who is expect to return on Sunday. Glenn has put up Hall-of-Fame numbers in his 14 seasons in the CFL. With a full week of practice with the first-team offence, expect Glenn to be that much more efficient going forward. Life is also coming full circle with Glenn, who started his CFL career with the Roughriders before moving on to play with Winnipeg, Calgary, Hamilton and British Columbia. The 2003 West Final looked at one time to be Glenn’s last with the Roughriders. As a backup, he entered the contest with the Riders trailing the host Edmonton Eskimos 23-2 for an ineffective Nealon Greene. Glenn gave the Roughriders a chance to in that contest, who eventually fell 30-23. During that offseason, the Roughriders brass of general manager Roy Shivers and head coach Danny Barrett backed Greene, who had been erratic his whole Roughriders tenure, as the starter going into 2004. That decision led to Glenn’s departure from Rider Nation, as many felt he should have been elevated or given the chance to compete for starter status. Glenn resurfaced in 2004 with the Bombers after a couple of transactions. Now a cagey veteran, Glenn will have his chance to lead the Riders as the starter. • Kicker Paul McCallum also had a back to the future moment, when he resurfaced with the Roughriders this week. 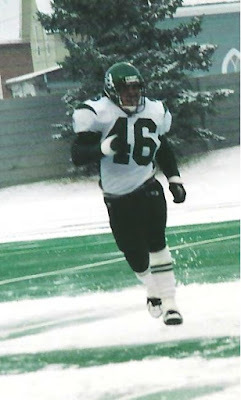 The 45-year-old last played for the Roughriders in 2005 before moving on to excel with the B.C. Lions. McCallum’s name was linked with one of the most infamous moments in the Riders’ history. After he missed a chip shot field goal in overtime of the 2004 West Final helping the host B.C. Lions pull out a 27-25 win, his home was vandalized, he was threatened and manure was dumped on his neighbour’s property. McCallum was brought back to add more consistency with the kicking game, which wasn’t there with Chris Milo. Milo, who is well-liked by the Roughriders organization, struggled last season hitting 71.4 per cent of his field goals, and he often hit the post. He was 1-for-2 in the team’s regular season opener, but it is obvious the Saskatchewan coaches still have big concerns. Since 2009, McCallum hasn’t had a campaign where he has made less than 84.6 per cent of his kicks. Last season, he made 38-of-42 field goals for a 90.5 per cent success rate. Any one that has followed football for any length of time knows an accurate place kicker will always find work and age won’t be a barrier. Over the long term, the Roughriders would love for Milo to regain his form from 2013, when he made 46-of-52 field goals for an 88.5 per cent success rate. • As the Roughriders go forward, the coaches also have to step up their game. Since becoming the Roughriders head coach in 2011, Corey Chamblin has done an excellent job overall. With that said, the coaches always have to get better too. Chamblin preaches that to his players and that also has to stick to himself and his staff. In the opener with the Roughriders down 30-26, they faced a third and three from midfield with under three minutes to play. Chamblin went with conventional wisdom, and the Roughriders punted hoping to get a defensive stop and one last possession. Coaches are responsible for putting their players in the best positions to win the game, and this looked like a smart move. Unfortunately, Chamblin didn’t do a good job in reading the flow of the play. The offensives on both sides were running the show. At that time in place, the Roughriders needed to get the go-ahead score, as time was running out. Chamblin needed to mirror Bill Belichick, who is the head coach of the NFL’s New England Patriots, and gamble at this point in time. With the way the Bombers were moving the ball, the chances were high the Roughriders would not get another possession, and Winnipeg did indeed ground out the clock. A good head coach knows that each game contains its own story and makes the best decisions to try and win with what is occurring. He can’t worry about making a decision to slight one side of the ball or the other, and he is able to get that message across to his players no matter what the outcome. Belichick always has the message that he always expects to make it when he gambles. Chamblin can say the same thing, if the gamble doesn’t work. At some point in time, the game hits a critical juncture, where you have to go for it. Chamblin needed to gamble on that third and three. • Penalties. As far as penalties go, the officials should go back to calling things the way they did in 2013. The tweaks that have been made to calling penalties in 2014 and this season have helped grind the CFL game down. The way calls have been made in 2015 really hasn’t led to more scoring in the early going outside of the Hamilton Tigers-Cats bombing the Blue Bombers 52-26 on Thursday night in Winnipeg. The only other squad to score 30 or more points was when the Bombers beat the Roughriders on June 27 at Mosaic. Offence wasn’t really broke in 2013 and didn’t really need fixing. If you have any feedback about this blog post, feel free to email them to stankssports@gmail.com.